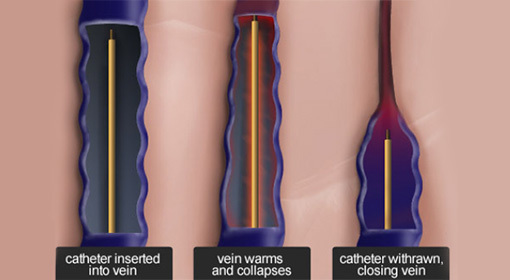 Phlebectomy is a minimally-invasive surgical procedure that removes bulging varicose veins through multiple small 2–3 mm incisions in the skin overlying the varicose veins..
grasps the vein and removes it. The wounds are then closed with minimal stitches or skin adhesive glue. The area is covered with gauze and compression bandages are applied. Phlebectomy might be done along with another treatment for varicose veins, including radiofrequency ablation of the saphenous vein in the same limb. This procedure typically does not require a stay in the hospital. Phlebectomy is usually performed in a doctor’s office minor surgical operating room using local anesthesia and sometimes light sedation. First, the veins are identified and marked with the patient in standing position. 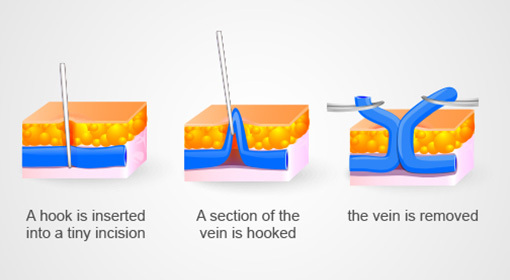 Once in the procedure room, a local anesthetic fluid is injected into the area of varicose vein clusters to be treated. The doctor then uses a small scalpel to create tiny incisions, inserts a small hook, grasps the vein and removes it. The wounds are then closed with minimal stitches or skin adhesive glue. The area is covered with gauze and compression bandages are applied. Alternative medicines and exercise programs that target the calf muscle pump can improve the symptoms associated with venous disease. Laser therapy is used to heat the blood vessel to shrink it. One of the common minimally invasive options to treat varicose or spider veins is sclerotherapy.